Steven Garreyn is no stranger to low cars: through our attempts to communicate with a translator and broken english, I gather he's owned more cars than he can even begin to recall. The one thing he does know, however, is that he's lowered each car as much as possible. 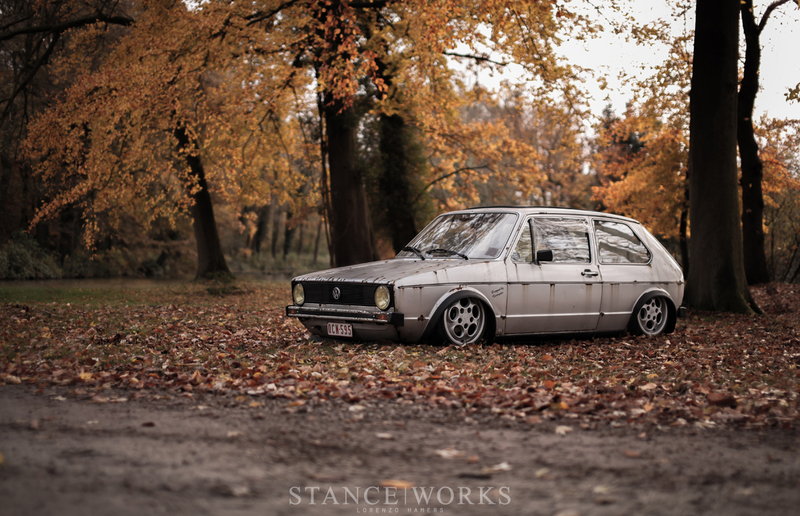 He's squeezed every last millimeter from each build he's taken on, and each one continues to be a small step further than the last - yet none come close to his latest creation: a body-dropped MK1 Golf. 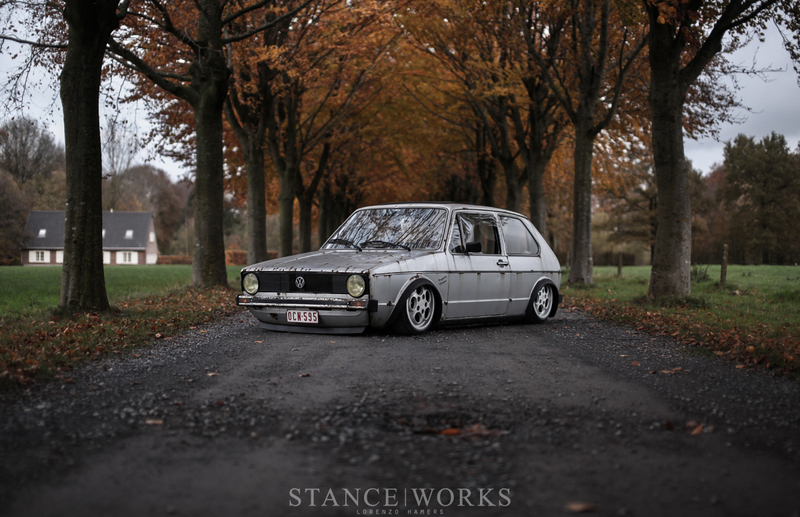 The Volkswagen world has been, for quite some time, the epicenter of low cars. 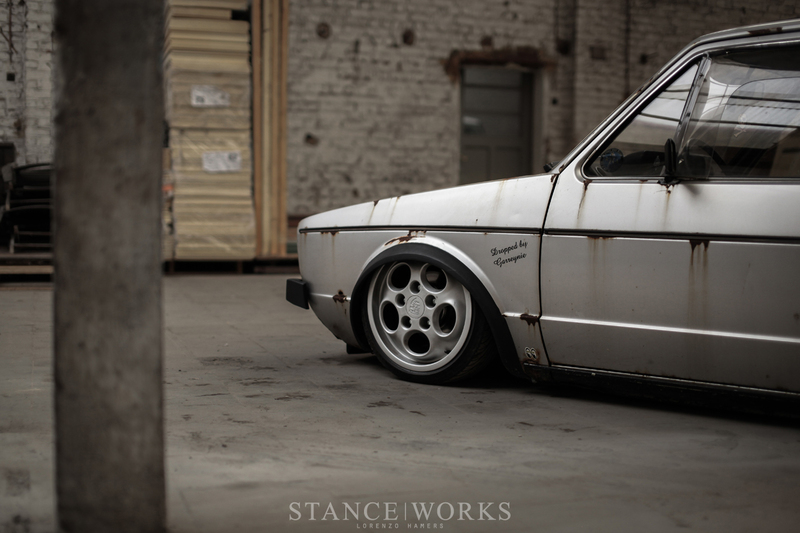 Most would credit VW culture with the birth of the "stance" scene, with most high-profile builds generally aiming for one of two things: a level of cleanliness, execution, thought, and polish above all others, or to close the gap between car and earth moreso than anyone before. For Steven, his build quite obviously fell into the latter on all counts, and the idea began more than four years ago. 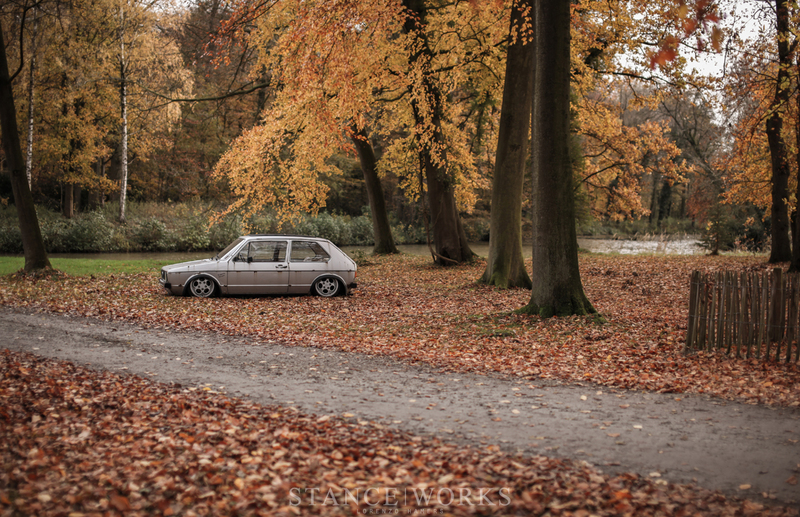 In contrast to cleanliness, Steven's MK1 spent much of it's life under a tree, rotting away in spots thanks to sap and bird droppings. For many, it's a sign for much worse to come, but for Steven, it was "perfect." 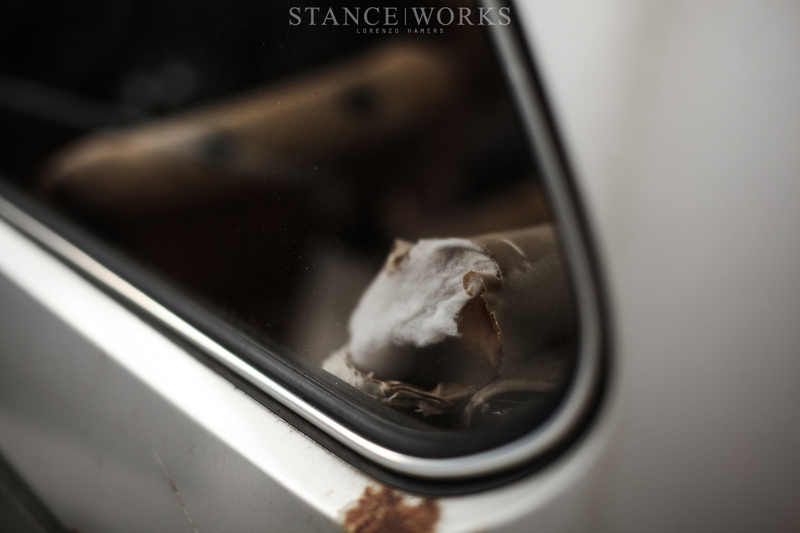 He was after a car that looked all but entirely forgotten, rust included, and this very example could cap off plans that Steven had been churning around in his mind for years prior. 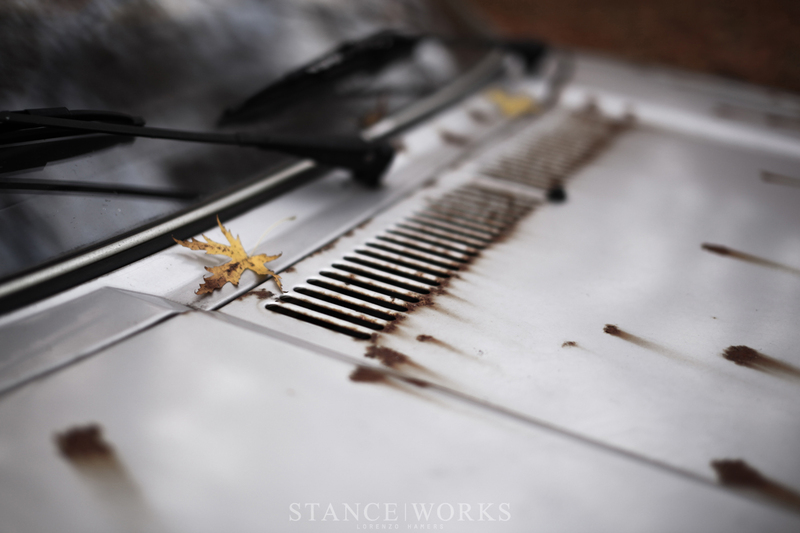 His past builds worked their way up in complexity, but after enough time wasted on other cars, and having found the rusty silver example rotting away, he knew it was time to pull the trigger. After hauling the car home, he began working immediately. As Steven put it, "I wanted to give 200% to this car." Standard air suspension and off-the-shelf parts weren't going to do the trick. Instead, he pulled out every cutting tool he owned and began throwing sparks. Steven began with the front of the car. The inner metalwork was cut out to make room for the rather large 16" Porsche phone dials, as well as the new air suspension. The air struts themselves brought the car down, but not nearly enough; after shortening the struts further, the real work began. After very careful and extensive measuring, each suspension pickup point on the car was cut out off the car and moved upwards just over two inches. 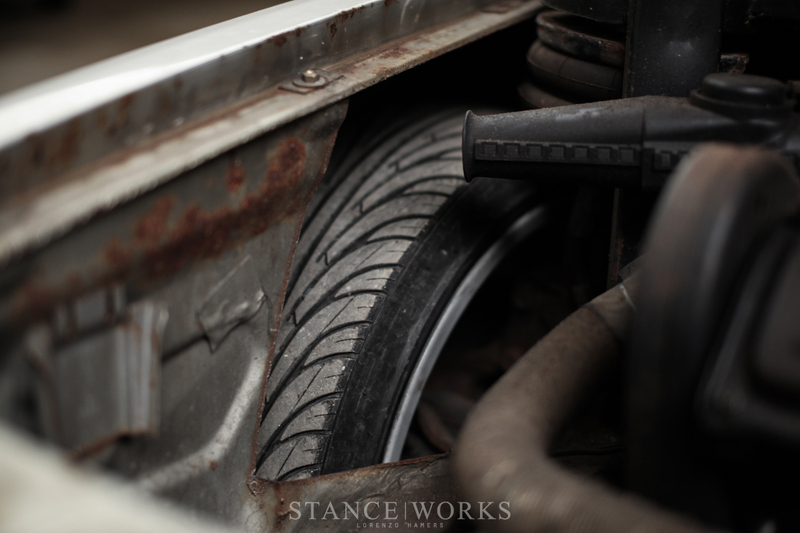 This allowed Steven's MK1 to retain the correct geometry for driving, while simultaneously allowing it to sit two inches lower than it had before. The remaining pieces of the car that sat lower than the engine were modified, removed, or simply cut away, all in the name of pushing the car as close to the asphalt as possible. A new steel subframe was built to keep everything in order. 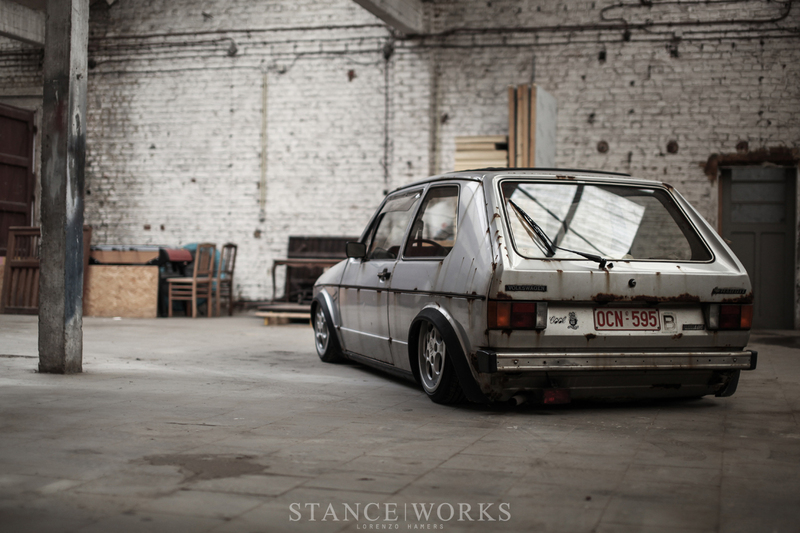 The tail end of the MK1 received a very similar treatment. The wheel wells were cut away to allow the car to sit lower, and the gas tank of the car was removed, and an aftermarket one relocated, to allow for the rear beam to travel without interference. The brake lines and fuel lines were all reconfigured, and then the air suspension was installed. The end result is a car that has the suspension geometry, and clearance, to drive just fractions of an inch off the ground. One important factor to the car for Steven was that from the outside, aside from it's absurdly low ride height, one would be unable to tell that the car had been tampered with. With that in mind, he kept the original, worn-out interior, but making the back seats fit with the changes he had made to the wheel wells and rear flooring proved to be a struggle. 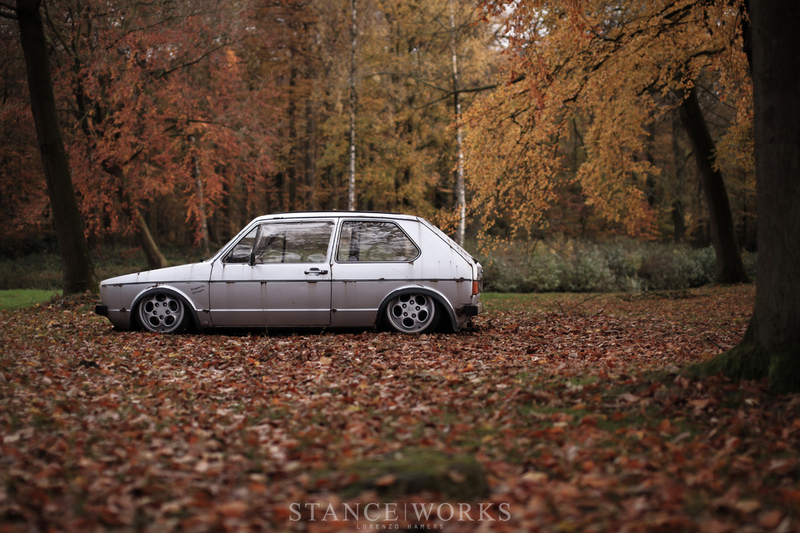 With everything assembled, and nearly as it was, Steven Garreyn is left with a MK1 Golf that is both wonderfully simple and impressively complex. 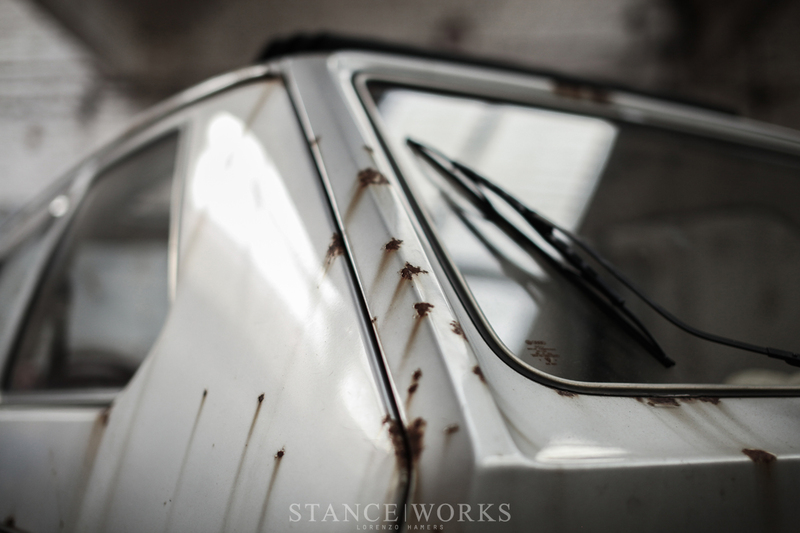 The original, beat up nature of the iconic hatchback has been embraced to the fullest, yet Steven has given the his car own very unique touch. 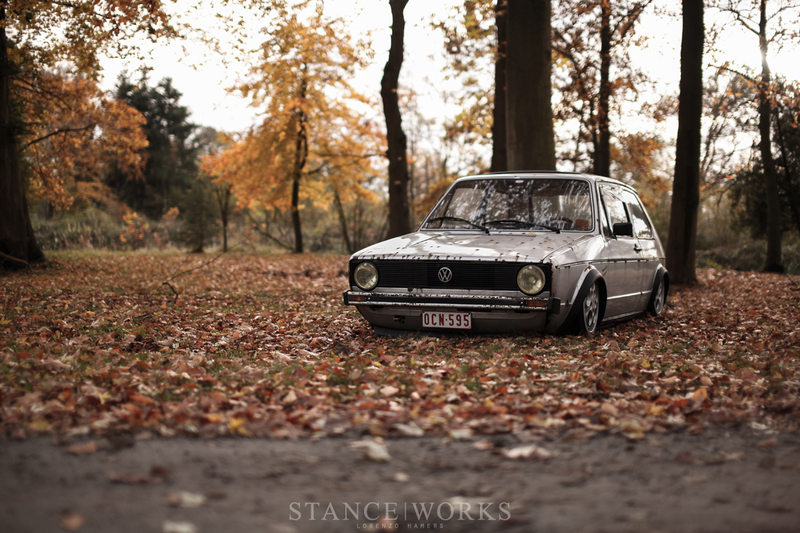 The MK1 looks right at home, hovering above the ground, just where the Volkswagen Gods had intended. As for what's next, even Steven is unsure. He has promised one thing though: "It will be far more extreme than this." I kind of understand it. But it looks.. well, I wouldn’t be seen in it, and I certainly wouldn’t want to drive it. I understand this whole “go your own way” thing. But it should serve some sort of purpose, shouldnt it? It looks awesome, IMO. If it had a different look or purpose, then we might have not seen it on SW. There is a certain joy to be found in challenging yourself to create something from your own imagination…to build something the way you want to. 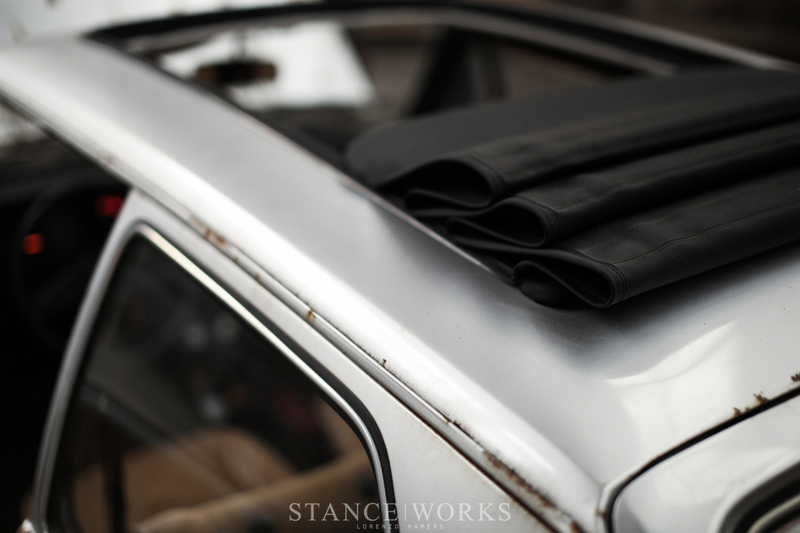 A car’s purpose can exist as a form of expression through building and creation. This car’s purpose is one of aesthetics and its purpose has been executed well.While the patina look is not for everybody, it’s a visual concept that has been celebrated for centuries. It’s a reverence for the beauty that can be found in the natural wear and imperfections of time. it looks good, somehow as menacing youth counterculture car, but I wonder for how long can it be driven that way? it seems impossible not to have it damaged on the road? does a car like this have some protection underneath and how careful you have to be not to break it on even the smallest bumps? @wacom It is clearly bagged, look at the ninth image. Just raise er’ drive away, park, lower, saves the bottom of your car a lot of a damage.